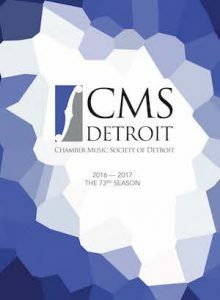 The Chamber Music Society of Detroit is one of the oldest and most prestigious music chambers in the United States. Their mission is to present chamber musicians of international stature to thousands of audience members and to enrich the cultural life of Metro Detroit. Roberts Restaurant Group is proud to be their official restaurant partner for the 2016-2017 season. For more information and this season’s schedule of performances, click here.